Jane had always worked in the environmental sector, but found herself increasingly absorbed in the world of food and in particular, eating for health. She started picking and cooking with seaweed, and the more she found out about it, the more it seemed a natural fit with both of her passions - environmental sustainability and healthy eating. Seaweed is incredibly nutritious with high levels of antioxidants and an array of vitamins and minerals. However it's not always obvious how to use it, so Jane created Octopus’s Garden Seaweed with the aim of making the delicious flavours and health benefits of seaweed available to more people. 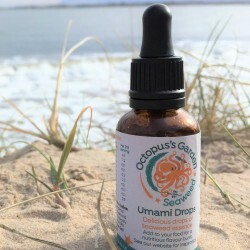 Her Umami Drops distil the delectable flavour and benefits of 'Dabberlocks' seaweed into a highly versatile concentrated essence that can be enjoyed on its own, as a condiment, or to add flavour and goodness to your cooking.